We have a recirculating creek in our backyard that Delia long ago named Butyl Creek. After a dry spring and a dry summer, it may hold even more attraction for the birds heading south through Seattle than usual. At the risk of sounding cheerful about the plight of birds in the world today, we’re having a better than average fall migration. 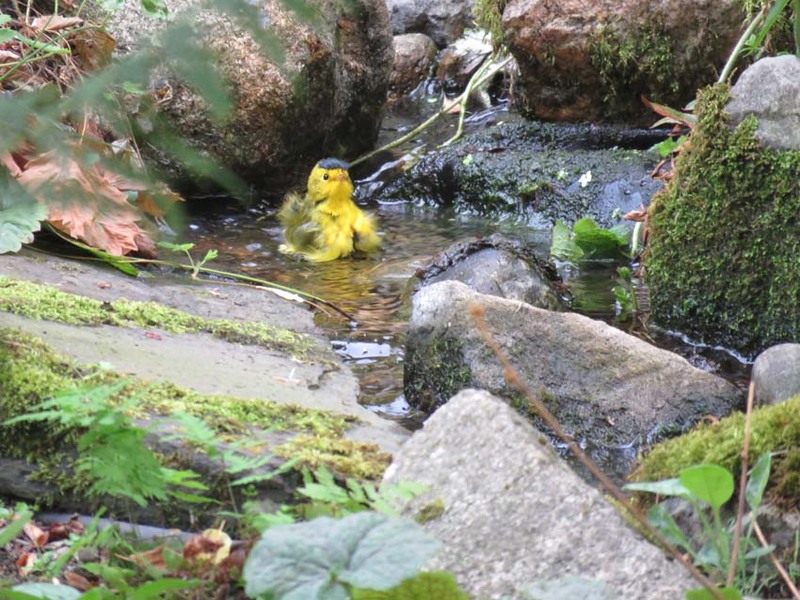 Here a Yellow Warbler prepares to bathe in a pool in Butyl Creek. 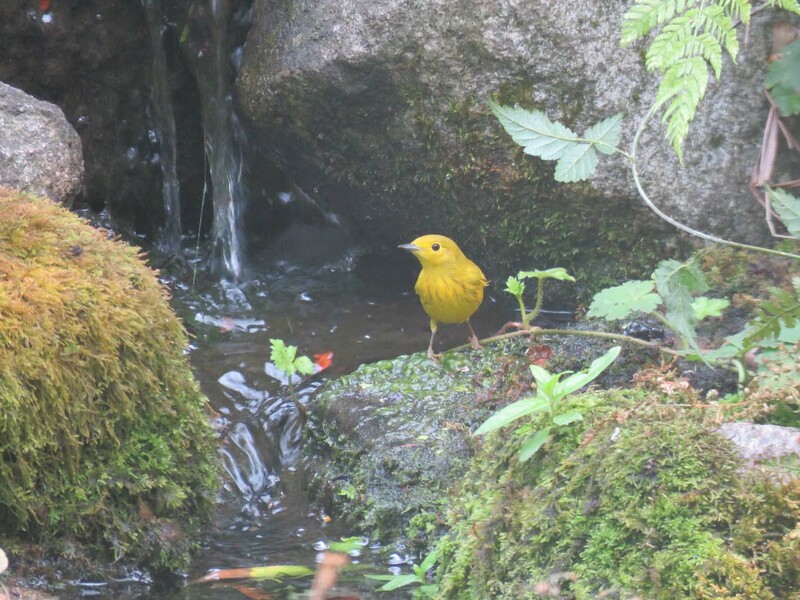 And this is a Wilson’s Warbler from mid August at the Creek. We’ve also had multiple daily Orange-crowned Warblers for over a month, and on Sept. 21 a juvenile MacGillivray’s Warbler came through. A Willow Flycatcher contemplates it’s next dive. This bird is a member of the Tyrant Flycatcher family and tyrants don’t bathe like our other birds but plunge in and out of the water in one motion. 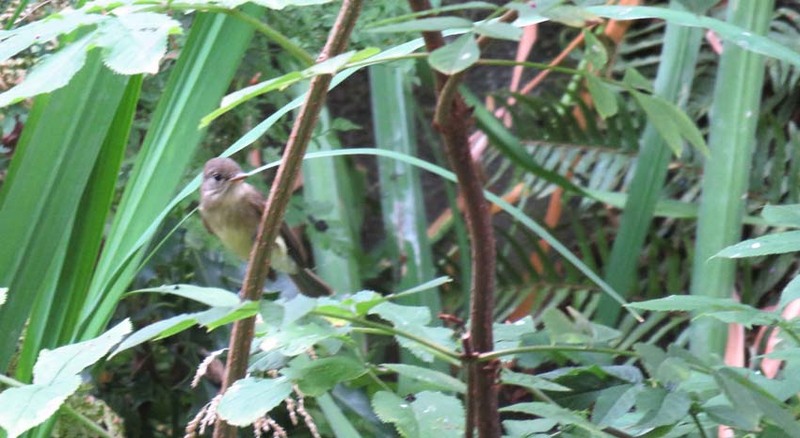 We’ve also had Western Wood-pewees and Pacific-slope Flycatchers. 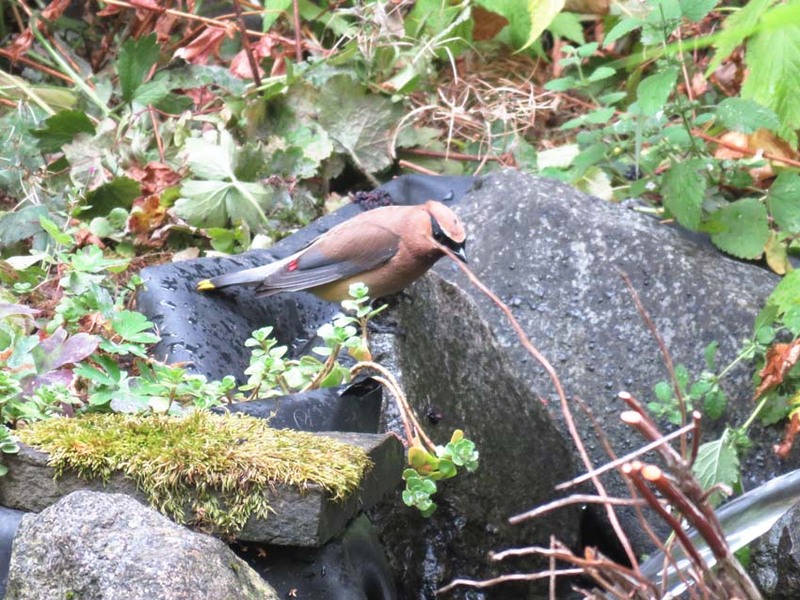 Here is one of the Cedar Waxwings that’s been coming in for baths at the creek every day for several weeks. 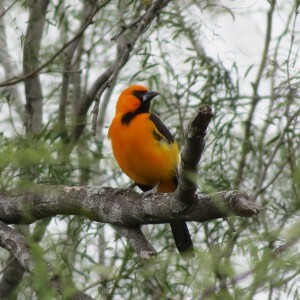 We’ve had quite a few Western Tanagers come through, in very muted fall plumages. These birds looked ready to fight, then decided there was plenty of room for both of them. 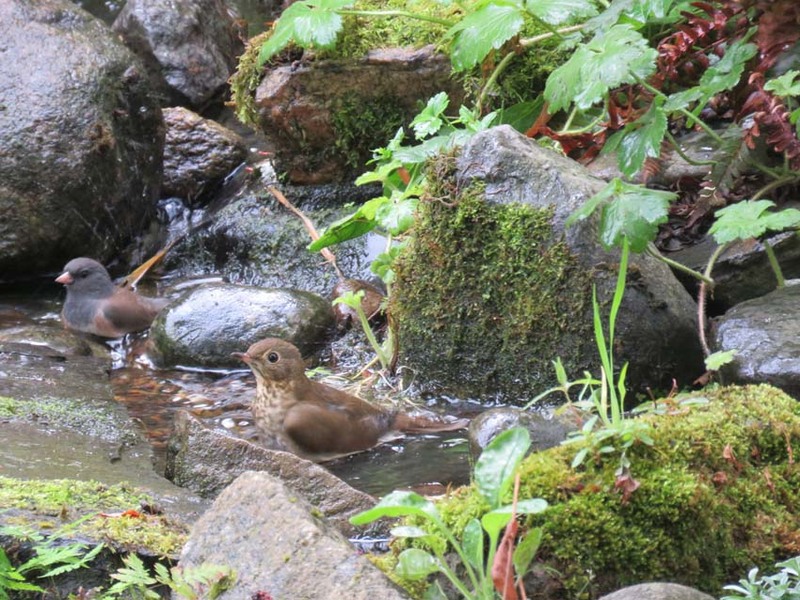 A Dark-eyed Junco and a Swainson’s Thrush. 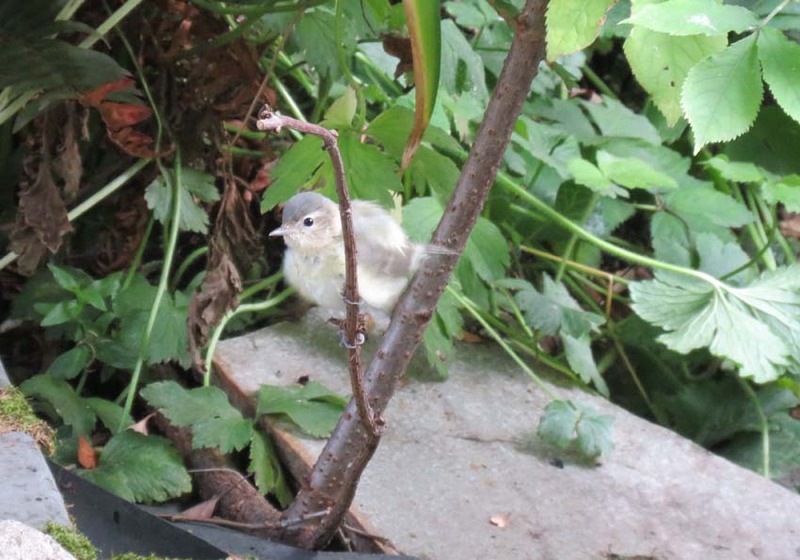 When Warbling Vireos bath, They they lose their shape and become a ball of feathers. 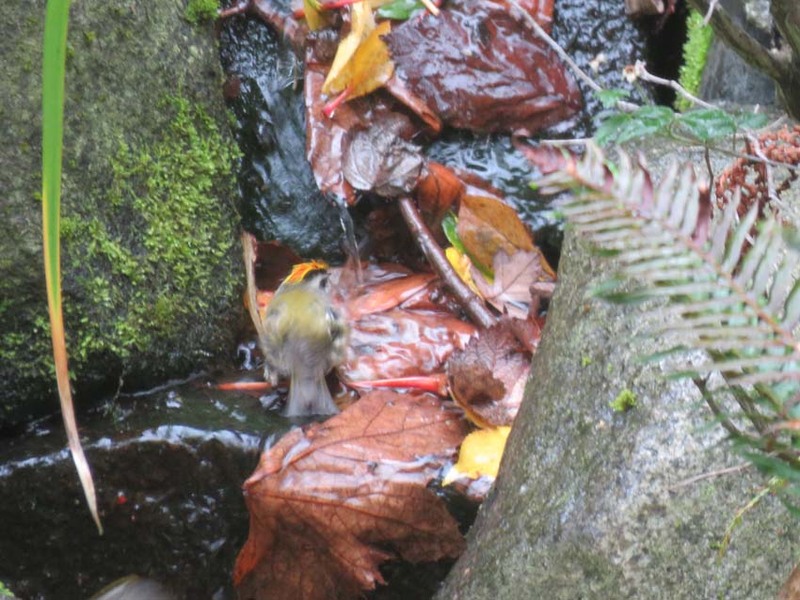 Multiple Warbling Vireos have come by to bathe, but we haven’t seen any Cassin’s, Red-eyed or Hutton’s Vireos. We seem to almost never get those species. 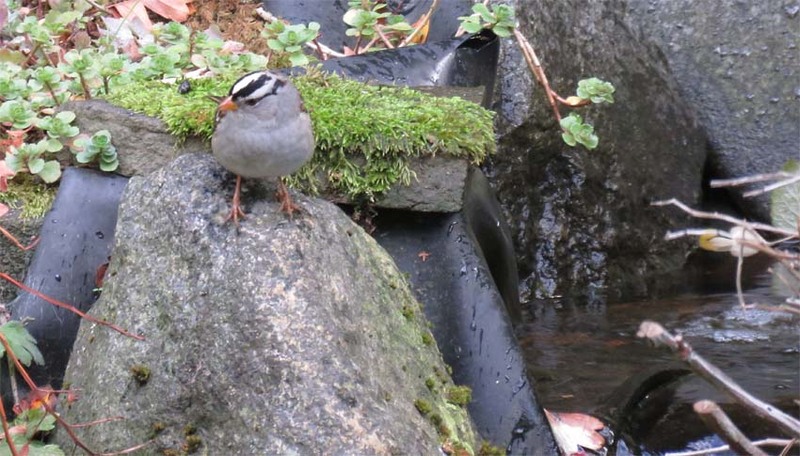 The White-crowned Sparrows are back, as are the Golden-crowned Sparrows. Lincoln’s Sparrows came in twice and we missed the shot both times. 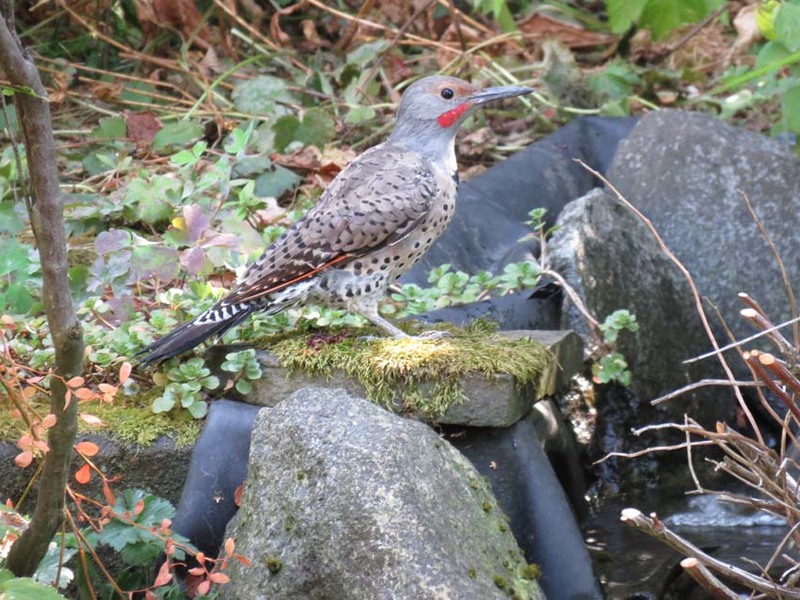 Here’s a Northern Flicker ready for a bath. 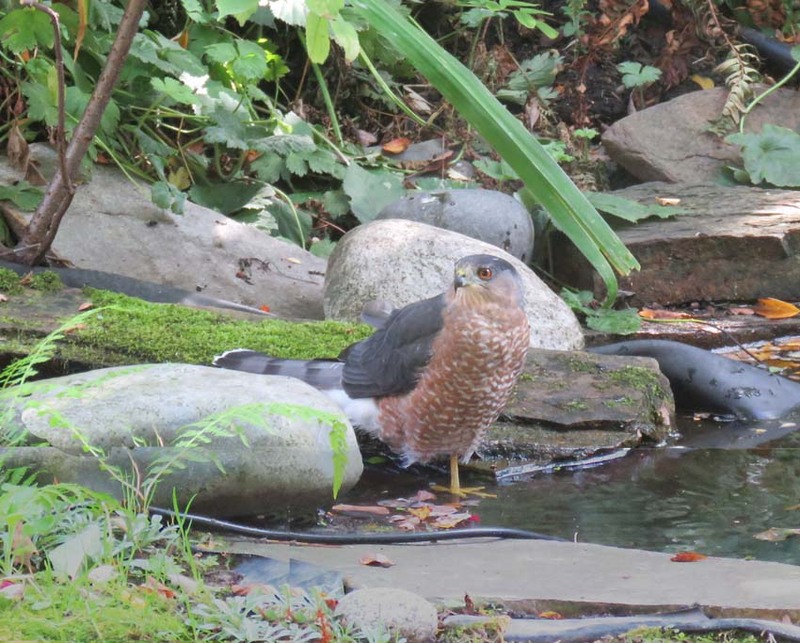 This adult Cooper’s Hawk was taken by Delia. It’s my favorite Cooper’s Hawk shot of all time, partly because this bird is just so amazingly…good-looking–(and I’ve seen a lot of Cooper’s Hawks!) I suspect it’s a male, it’s not very big, and the red eye implies it’s an older bird as the eye becomes redder with age. This is actually a missed shot. 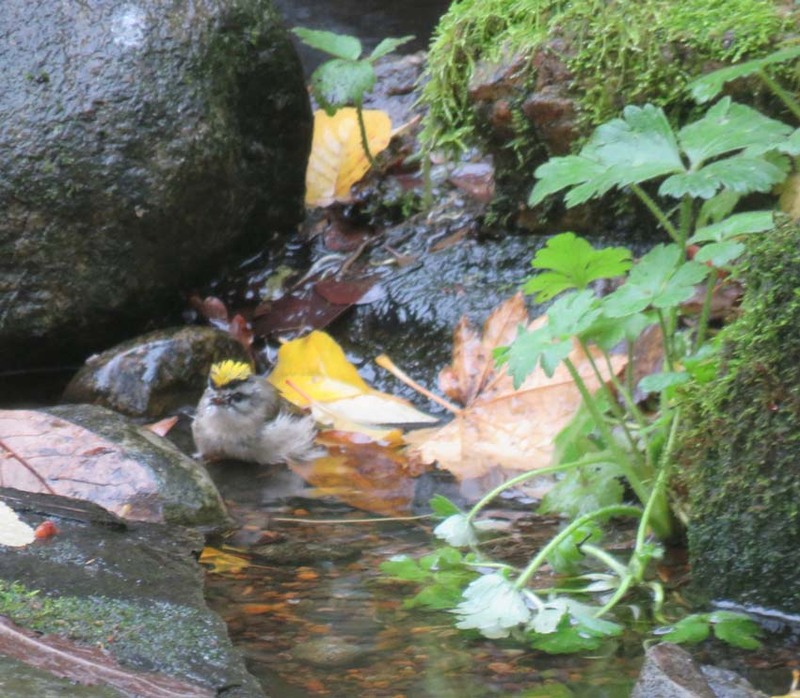 When male Golden-crowned Kinglets bathe, they look like little kings with bright red orange crowns. I only got this guy looking away. This species is very connubial, with male and female pairs hanging very close together all winter. I’m hoping to get this guy when this pair next comes in to bathe, which they do more or less every day now (writing in November. Females go crazy too when bathing, as the female of the pair is doing now. 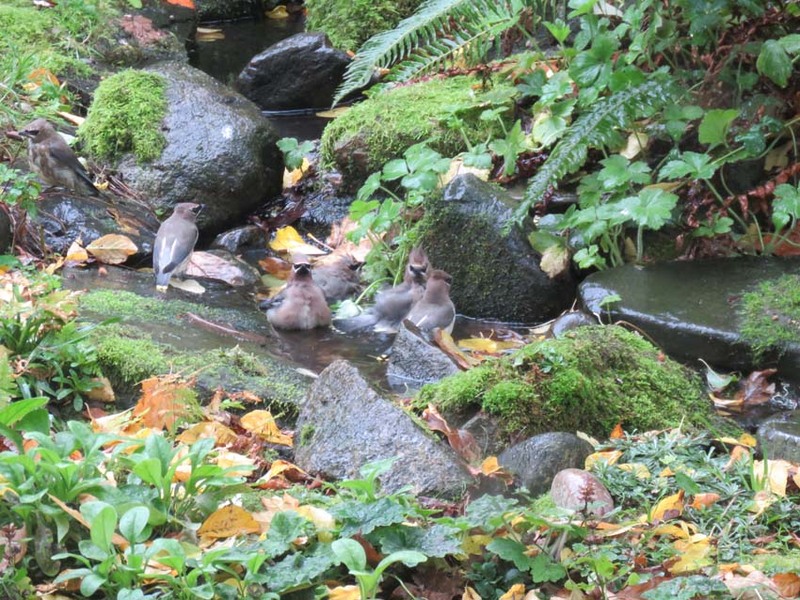 Here is a conference-bath of Cedar Waxwings from early November. Waxwings are very flock-oriented and as this shot shows, they all bathe together. 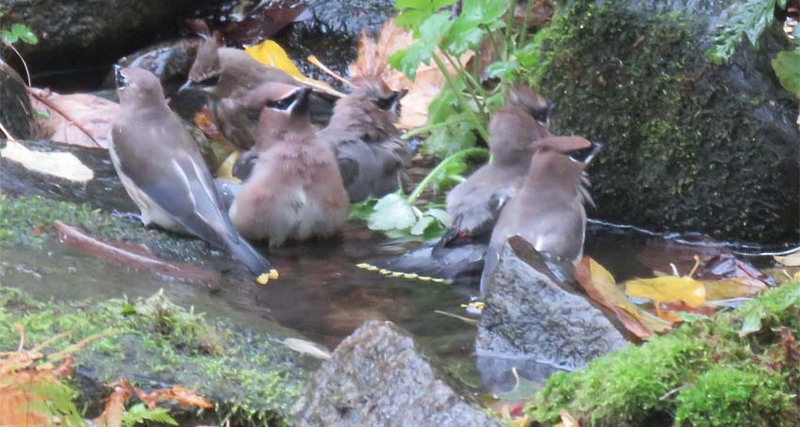 Here’s a wider angle on Cedar Waxwings bathing. 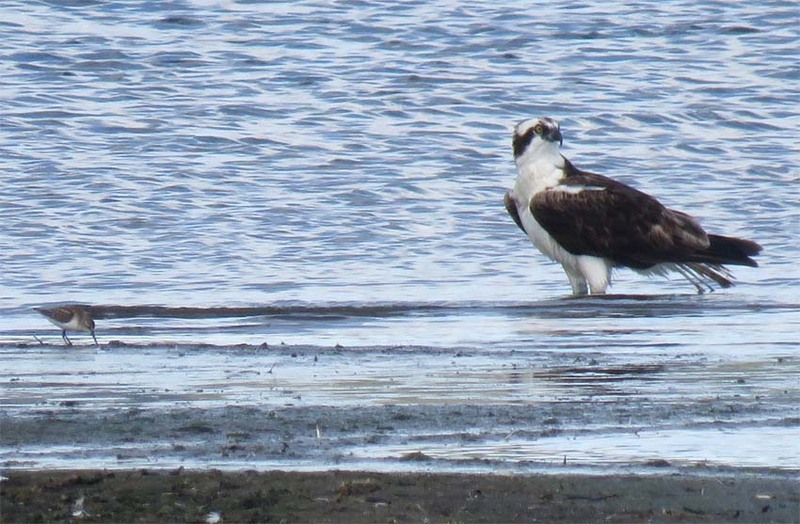 Down in Renton at the mouth of the Cedar River a big (presumably) female Osprey posed on the beach with a Western Sandpiper. I guess I was surprised by the difference in size. This action shot is from Alki. 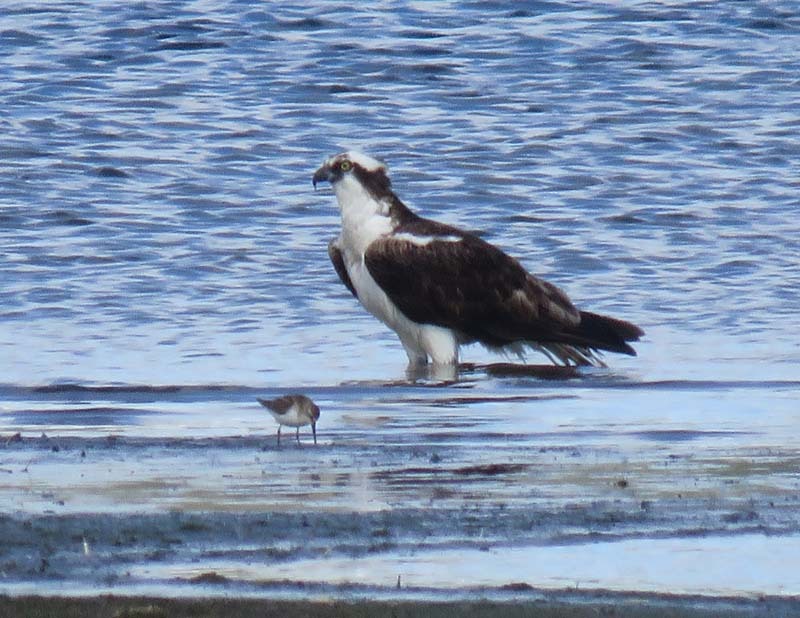 I don’t know what the lower limit is for technical quality of photography on the Information Highway, but even though this shot of an Osprey with a fish being chased by a Glaucous-winged Gull is poor, it interested me because of the size of the fish and the possibility that someone who knows something could identify it–well, maybe. 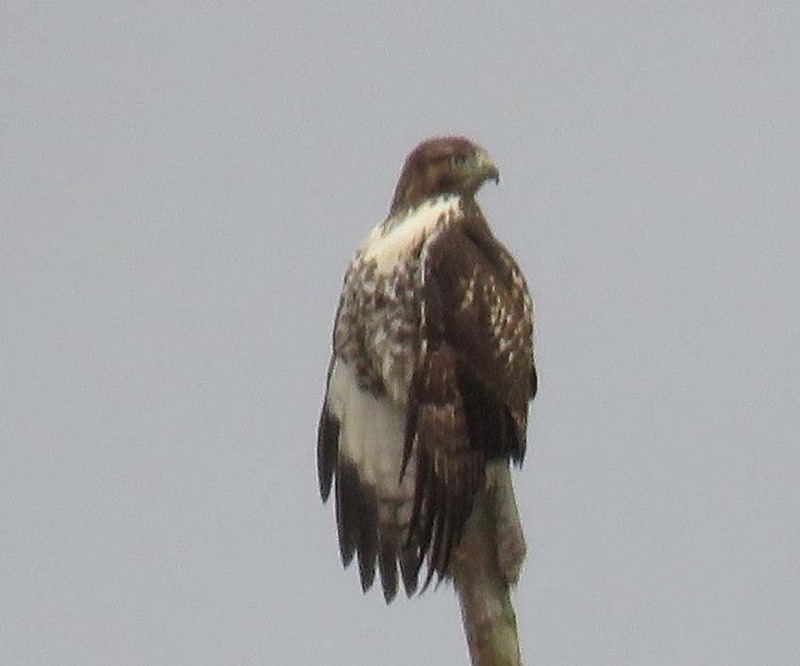 This young Red-tailed Hawk was up on the Skagit at Wylie Slough near Conway. She (?) was trying to dry out after a rain. I thought it made for a great pose. 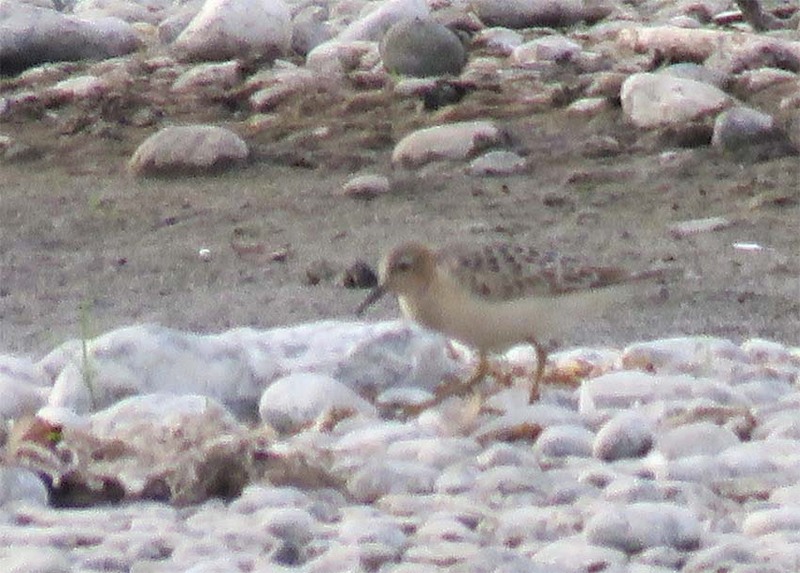 Yesterday Sept 1 we were lucky to see this uncommonly-seen Sandpiper, a Buff-breasted Sandpiper that was found by Garrett Hayes and watched and photographed by Bobby and Curt Pearson for a couple hours at the mouth of the Cedar River in Renton. 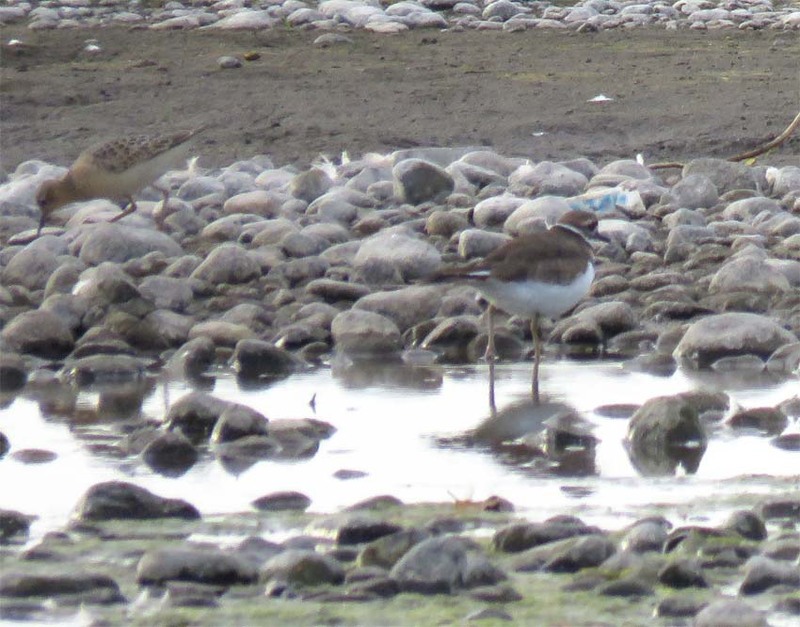 Here is a shot that shows the Buff-breasted Sandpiper near a Killdeer, showing its relative smaller size. It also shows why this bird can be so beloved by birders, even as a member of a group, Shorebirds, that are already especially beloved. 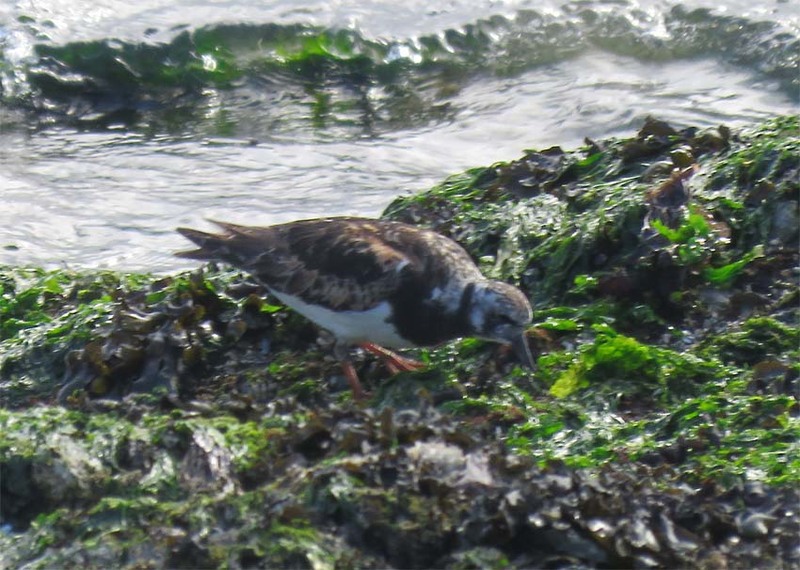 Speaking of Sandpipers, this Ruddy Turnstone showed up at Constellation Beach, around the corner from Alki, in September. 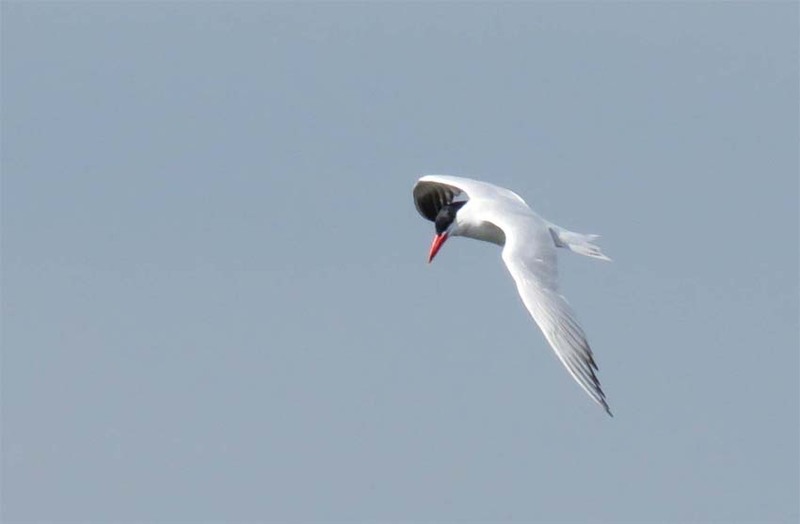 It’s been a tough year for Swallows in the city but it continues to be a great year for Ospreys and Caspian Terns, two birds whose beauty is only exceeded by the difficulty of getting decent shots of them. We went up to Sunrise which was smokey. 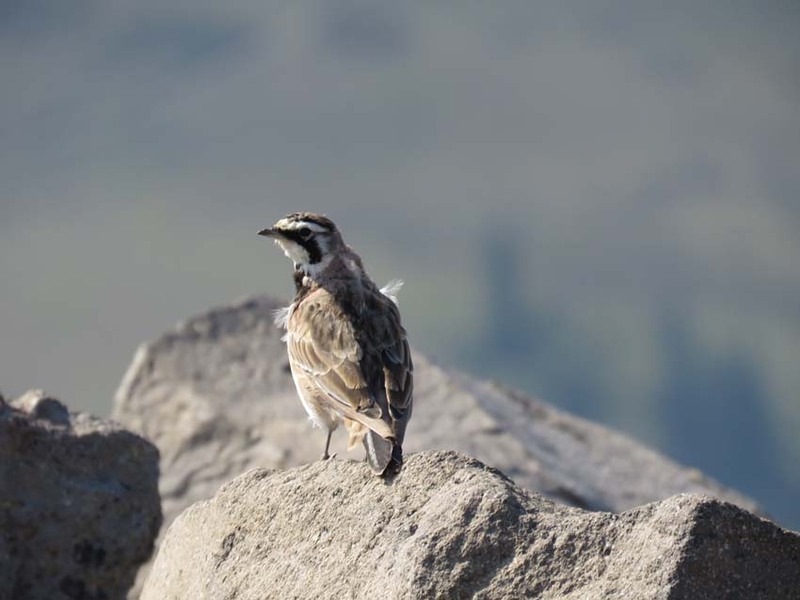 Here is a Horned Lark on First Burroughs. We found many, many Mountain Bluebirds, Yellow-rumped Warblers and Cassin’s Finches below the parking lot in that relatively lush meadow area also. 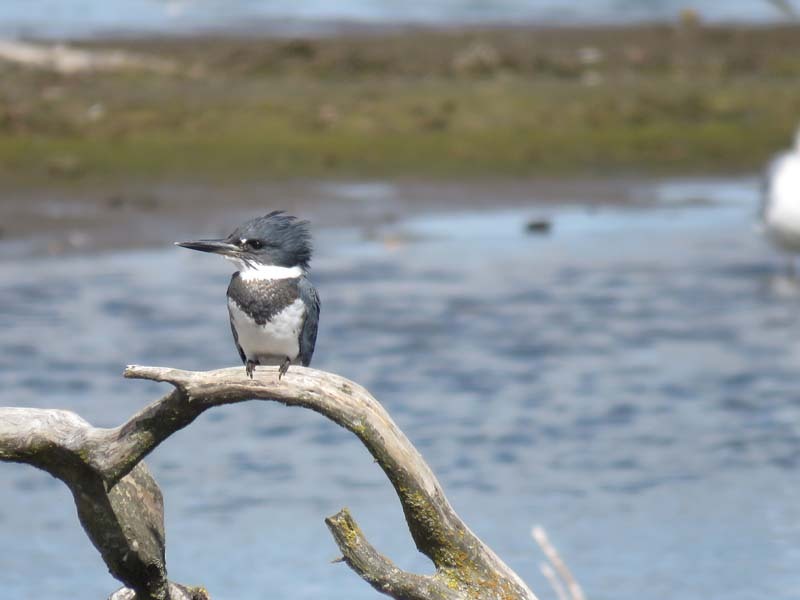 Below is another bird from the mouth of the Cedar River, a Belted Kingfisher.